Me SP & the Bean. : holly jolly. 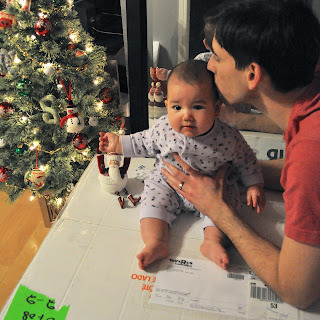 Our big little girl (as confirmed by the paediatrician once again at her 6 month visit), sitting on top of her very big gift, beside out little tree. More interested in Santa though. We finished our Christmas shopping in an extremely timely fashion this year. Since becoming a parent, tragedies involving children have become infinitely more emotional. safely to sleep in her bed. My thoughts are with the community of Newtown CT.
"Safety and security don't just happen, they are the result of collective consensus and public investment. We owe our children, the most vulnerable citizens in our society, a life free of violence and fear"
Lol, you just need to put the tree on top of the gifts to make it look bigger!! Caidy's first word was "Ho ho ho" so Santa is always a winner!! Hope you all have a wonderful Christmas!!!! kerry you're so right! we should have put the tree on top of the box. hope you guys have a wonderful xmas, and i'd love to get together again soon in the new year!